Over the years, there's been much feedback from visitors to the Digger Archives web site. Some have used the site for school research, some for dissertations, some for books, some for media studies, etc. etc. There is much more in the online archive than is listed below. Just follow the links on the top entry page. But the items below are special—at least for the person who built this site. Loren Sears' Gallery of Hippie Tribal Home Movies (1967+). The 1968 film Have You Heard of the San Francisco Mime Troupe? The Inter-Communal Free Carnival (1972) featuring the Angels of Light "Peking on Acid" extravaganza. It Was Twenty Years Ago Today (1987), the British film retrospective on the Beatles, with Digger interviews and footage including Death of Hippie. 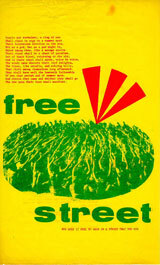 Berkeley In The Sixties (1990), a film that documents the fusion of the radical political and cultural movements that led to the formation of the Sixties Counterculture. Remembering Peter Berg, a film that Lila Talcott Travis put together for Peter's memorial in 2011. Kent Minnault's performance piece (2013) on the early Digger food runs. The Diggers segment from the NBC Bay Area documentary (2017) on the Summer of Love features an interview with Vicki Pollack along with rare footage of the Digger free store "Trip Without A Ticket" on Cole Street.